The Maker Movement is a cultural phenomenon and is highly inclusive as everyone is welcome, regardless of their race, financial status or background. It is also changing the way we learn, discover and innovate and is seen as a valuable contributor to our local economy. A makerspace is a workshop where professionals, novices, entrepreneurs or students alike can come together under one roof to collaborate and share ideas or work on individual projects with a firm focus on STEM (Science, Technology, Engineering and Mathematics) subjects. There are nearly over a 100 makerspaces across the UK. This movement has now also been firmly embedded into well know established universities and colleges across the country and are viewed as a key selling point when talking to prospective students and forms a compelling argument for learning through hands-on exploration. Makerspaces are also referred to as hackerspaces and Fab Labs and in certain instances provide communal facilities in an open accessible space, giving access to resources including digital fabrication and electronics. These spaces are also viewed as social spaces, with a focus on wellbeing which serve the needs of the local community and specifically the disadvantaged within these communities via outreach programmes. Imperial College London is a fine example of a well-established institute with a dedicated outreach programme. The maker movement is not the first social response to technological change that has championed making, according to a study carried out by the RSA (Royal Society for the encouragement of Arts, Manufactures and Commerce) and what sets the maker movement apart from the Luddite protests & The Arts and Crafts movement is that it has chosen to embrace new technologies rather than shun them. These spaces are naturally equipped with the latest technology such as 3D printers, laser cutters and computerised machine tools, with the added benefit that there will probably be somebody to show you how to operate the machine to execute your idea. Not too long ago prototypes had to be developed within the context of an established company because the tools to execute the idea were exclusively the territory of big corporations or research facilities. Designers can now use the technology available at these spaces to quickly develop and manufacture prototypes and get it then manufactured in bulk somewhere else and put on the market. Student are encouraged and assisted to bring their vision of a new product to fruition, translating an idea into a tangible, manufactured item. Students are here exposed to a real physical working environment where they can prepare themselves on what to expect within a professional setup. Project based and cross-disciplinary learning is considered more engaging, and can lead to results that contribute to innovation. UCL’s Institute of Making are currently conducting several research projects which could lead to exciting new innovations, such as a project that follows both new and familiar materials being developed for healthcare applications and Hands of X, exploring materials and prosthetic hands with amputees, designers and makers. The makerspace environment provide students with a head start by helping them to put theory into practice, providing them with self-confidence for the start of their careers and a platform where their ideas can be showcased to promote themselves to future companies for employment or plant the entrepreneurial seed to become self-sufficient. It is known that exposure to makerspaces and the skills obtained there makes it easier for students to get employed. Private industries are keen to partner with makerspaces as this provides them with direct access to innovation at grassroots level and keep them at the forefront of new design technology as it is developing, through partnership with well-established universities they can rest assured to get in direct contact with the best innovation and in turn support young innovators to become the best at their game. The makerspace environment is also less formalised and have greater possibilities for ingenuity. The Shed, University of Kent, established by the School of Computing, is a standalone structure which provides space for students to work, but staff can also use the space and activities and do not necessarily have to focus on taught modules, but personal hobbies can also be nurtured and developed here. Another good example of a very successful makerspace is the Institute of Making at UCL with the same module as The Shed, it’s exclusively open to students and staff and younger students have the benefit to run ideas past their more experienced peers. Both examples are contemporary in design, and it should also be noted that usually students are not charged for either machine or material usage in university-led makerspaces. 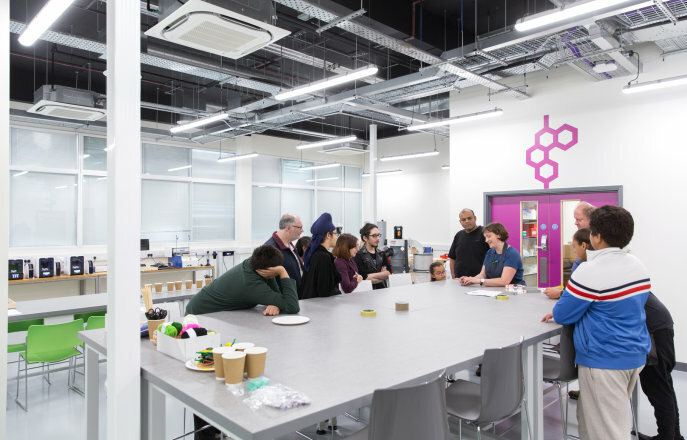 IBI has recently completed a makerspace for Imperial College in White City, Stadium House. The space is divided into three areas- the Hack, Shared and Outreach makerspace. The Hack area consists of a design challenge room, digital & electronics workshop, a metal and wood workshop and bio lab. The Outreach workshop consist of a classroom and a workshop area otherwise referred to as the makerspace workshop. The workshops could function in isolation of each other, but collaboration is encouraged and supported by simply opening the double doors of the shared facilities (store, office and lab prep), which separates the two areas thus providing direct access between the two workshops. People gather around a table at the Imperial College Makerspace. It is clear that the maker movement benefit individuals with a thirst to create and an important resource for our communities’ health and well-being and should not be seen as a gimmick, but as worthwhile and beneficial to our society and economy. The act to physically create or to formulate a practical solution for a problem give people the notion that they can have more control over their lives and determine their own destiny. Collaboration is encouraged and supported by simply opening the double doors of the shared facilities (store, office and lab prep), which separates the two areas thus providing direct access between the two workshops. It is clear that the maker movement benefit individuals with a thirst to create and an important resource for our communities’ health and well-being and should not be seen as a gimmick, but as worthwhile and beneficial to our society and economy. The act to physically create or to formulate a practical solution for a problem give people the notion that they can have more control over their lives and determine their own destiny.